Nakamichi Corporation was founded in Japan in 1948, and was the brainchild of Etsuro Nakamichi, a tape magnetics research engineer whose dream was to design superior quality reproduction equipment. Although it first started manufacturing radios, tonearms and loudspeakers, Etsuro was fascinated with the idea of reproduced sound through tape, and in 1951 started making open reel decks for other hi-fi brands. Throughout the fifties Etsuro continued his development work, and in 1957 a breakthrough occurred when he made a superior tape head with reproduction capabilities from 20Hz to 20kHz. During the nineteen sixties, Nakamichi made both open reel and cassette decks, but it wasn’t until 1972 that the first Nakamichi branded cassette deck was launched. The 1000 was also the world’s first three-head deck, and it was this – along with the beautiful 700 – which was instrumental in elevating cassette to become a serious music medium. Careful attention was paid to the electronics, too. Individual adjustment of left and right channels for both record and bias levels for all three tape positions was possible, with switchable EQ and Dolby B-C on the later models. This resulted in exceptional frequency response, headroom and distortion figures and overall sonic performance with the minimum use of signal processing (Nakamichi never used HX-PRO or Dolby-S). You can then understand what sets Nakamichi cassette decks apart from their rivals. No bells and whistles; just sound design and engineering. There has been much debate about the ultimate Nakamichi deck. Some people will contend that one of the early computing decks, the 1000ZXL in its huge wooden cabinet was the best; certainly it is the most complicated. But in the end, for sound quality it comes down to a straight choice between the Dragon and CR-7. There were a couple of turntables such as the Dragon-CT, but these never had the same appeal as the cassette decks and very few were sold in the UK. 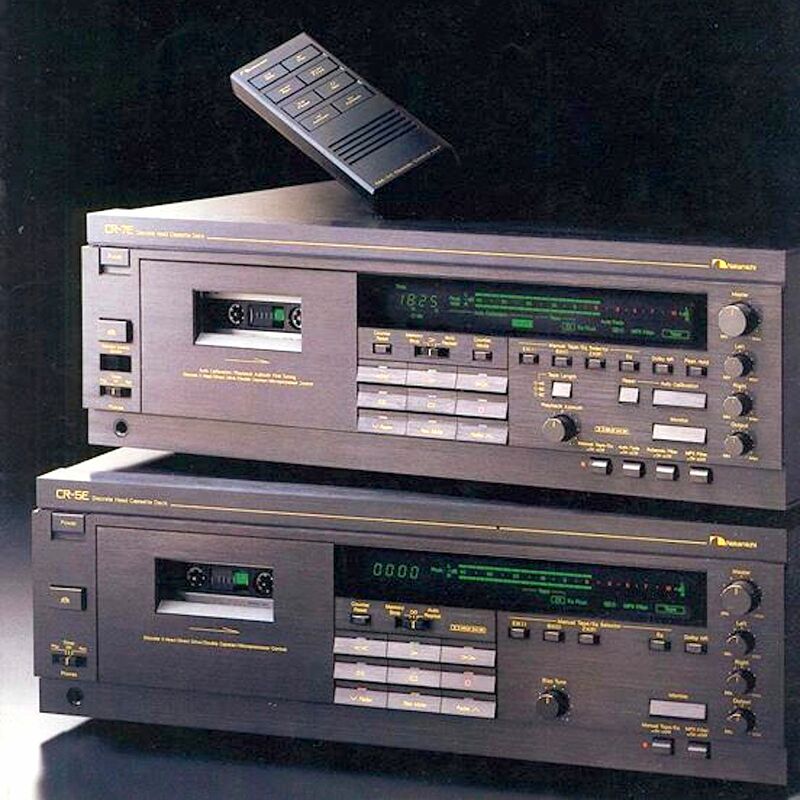 It did have some success with amplifiers and, indeed, later on with CD Players, but it was definitely the decks which made Nakamichi the legendary name it has become today. In 2015, the cassette revival is finally beginning to take shape and of course Nakamichis are high on people’s shopping lists. Bowers & Wilkins can still service them but new parts are now becoming scarce, so prospective purchasers shouldn’t spend large amounts of money on a restoration project only to find that spares are no longer available. Even the less expensive decks are lovely pieces of history, and give excellent service if you can find a good one. Cassette fans know that there will never be another brand like this. A very nice article about the “marriage” between Nakamichi and B&W during the cassette tape heyday era.